There’s no doubting the Mustang’s mass-market appeal, the proof is in the numbers. Ford recently passed a major milestone, announcing it has sold a staggering 9 million Mustangs since the car’s introduction in 1964. The result is a Mustang culture steeped in tradition, history, passion and of course, tuning. And when it comes to tuning Mustangs, no name elicits more respect and nostalgia than that of Carroll Shelby. So who better for Ford to partner with in order to create the most powerful factory Mustang in the company’s long and illustrious history. 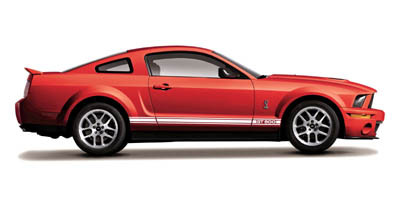 Thus, the two longtime partners have created the 2008 Ford Shelby GT500KR, harkening back to Shelby’s original 1968 GT500KR, an abbreviation for GT500 “King of the Road.â€ With design elements and parts coming from Ford, SVT, Ford Racing and Shelby motors, the 2008 GT500KR represents the ultimate factory Mustang and, with just over 1,700 models being produced, quite possibly the most exclusive as well. The GT500KR belts out possibly the loudest V-8 soundtrack we’ve ever heard and the supercharger isn’t far behind, emitting a piercing howl beyond 3,500 rpm. All that noise isn’t just for show and keeping the KR below the speed limit is mostly an exercise in futility. The KR’s lofty price tag and limited production gives it real “collector carâ€ appeal, meaning few will see (or equally important, hear) one on the road, let alone have the opportunity to own an example. Those who do are well advised to invest in oil stocks, as they’ll be habitually refueling the KR. Big power is the GT500KR’s obvious appeal and it doesn’t disappoint, belting out 540 horsepower. The supercharged V-8 sees the GT500KR to 60 mph in just 4.3 seconds and through the quarter mile shortly thereafter in 12.1 seconds. Without a doubt, the KR needs this power in order to hurl its bulky dimensions down the road because, despite being 22 lbs slimmer than the standard GT500, it still weighs in at 3,879 lbs. The heavy front end results in diminished feedback, though it’s certainly an improvement over the standard GT500. Despite its mass, the KR manages 1.00g on the skid pad thanks in part to bespoke Goodyear Eagle F1 soft compound tires, though the stiffer, lower suspension and revised camber setup certainly play a role as well. As such, where you think the KR’s rear end will break loose under mid-corner acceleration, with some minor throttle adjustment it just grips and goes. The stiffer setup manifests itself only on the roughest of roads and the same goes for the Mustang’s often-bashed live rear axle. The KR is powered by a violent, deafening Ford SVT-engineered 5.4-liter supercharged V-8, churning out 540 hp and 510 lb-ft of torque. Power is transmitted through the rear wheels via a shorter 3.73:1 final drive ratio (as opposed to the GT500’s 3.31:1), and the six-speed gearbox boasts 25 percent shorter throws than that of the GT500. The aerodynamics of the KR have been reworked with the primary focus being on stability at speed. The result is a pronounced carbon fiber front spoiler which increases front-end downforce by 31 percent, but just as noticeable is the short rear wing in the back, the aim of which is to reduce rear-end downforce, moving aero pressure closer to the car’s center of gravity. The ABS system and traction control have received extra tuning as well, and as a result, the traction control now yields improved straight line acceleration performance – something the KR excels at – while 60-0 braking has been reduced by 6 ft. It sounds strange, but the GT500KR’s hood is somewhat of a technological marvel. Formed from two pieces of carbon fiber, the Dual Chamber Ducted Hood not only weighs 11 lbs less than that of the GT500, but also features unique ducting chambers which isolate intake and outlet air. Basically, the inlets seen on the front of the KR’s hood feed to the air intake filter, which is sealed against the closed hood, isolating it from the rest of the engine compartment to prevent heat soak. At the same time, hot air rises into alternate ducting open to the engine bay, which then vents into the atmosphere through the topside engine vents. This ensures the KR inducts cold air into the supercharger while simultaneously shedding engine heat. So what of the KR’s mileage? In two words: Not good. EPA numbers haven’t been released yet, but the 5.4-liter supercharged V-8 is going to be thirsty, with Shelby reporting a combined cycle average consumption of 15.3 mpg throughout initial testing. Once you’ve heard the GT500KR’s exhaust note, however, you’ll realize you wouldn’t have it any other way. The KR distinguishes itself from standard Mustangs with a large, three-spoke steering wheel complete with requisite cobra logo, a Shelby Motors production plaque mounted between the center air vents and black sports seats featuring Carroll Shelby’s autograph on the headrest. Unfortunately, the interior plastics are still lower-level Mustang, and don’t match the hefty price tag. The seats are comfortable enough for long rides and the back seat is best suited for extra baggage, not people. Sitting lower than the GT500, the KR has an immediate sense of aggression about it from its front brake ducts and carbon fiber spoiler to the dual exhausts and massive rear tires. Shelby and GT500KR logos have been fitted around the exterior to remind you that this is a special Mustang; not that the exhaust note would ever let you forget it. Being king of the road comes at a shocking price - $79,995 to be exact – quite steep when you consider the standard GT500 is only $45,000. While the GT500KR outperforms the GT500 in every way, it’s hard to say the price hike is justified. However, considering there will only be 1,000 KR’s for 2008 and 746 for 2009, after which production will cease, the KR is very much a collector’s car. Still, slightly less could get you any number of evocative machines including a Porsche 911, Nissan GT-R, Lotus Exige S or, for $85,000, a Dodge Viper SRT-10. The GT500KR is more than homage to a long gone classic – not to mention a mouthful of letters and numbers – it is a truly capable high-performance machine. It may not be as nimble as some of the lightweight competition, but the appeal of the engine note alone is enough for most muscle car junkies. While the Ford Shelby GT500 KR might not be the absolute ruler of the road its name suggests, it’s certainly a member of the royal family. Miller Motorsports Park, located just outside Salt Lake City in Tooele, Utah, is home to the Ford Racing High Performance Driving School. Students have the option of courses ranging from an afternoon at the track to three-day high performance experiences, with all curriculum taking place in a 325hp Miller Mustang GT complete with racing seats and full roll cage. The cars are very forgiving and are ideal for those looking to perfect rear-wheel drive skills at speed. After adapting to the Miller GTs, certain courses offer students the option to get behind the wheel of a Ford Mustang Challenge Racecar. Weighing in 300 lbs less than the Miller GT and running on slick tires, the Challenge Racecar is an eye opener, with significantly improved braking, turn-in and massive grip. Having been given the opportunity to lap one on Miller’s West Course, we can confidently say that anyone who enjoys their time in the Miller GT won’t be able to rest until they’ve given the race version a try.